The software comes preloaded with an extensive suite of Machine Types and Machine Survey questions. Each machine is assigned a Machine Type and a series of pre-loaded machine-specific safety questions. 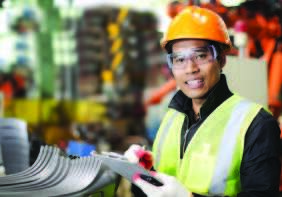 Nominally trained personnel can successfully conduct a machine safety audit by answering a series of Yes/No machine specific safety questions that are designed to lead them through the process. Questions are also linked to the specific regulations and standards that apply to the question to reduce confusion and misinterpretation.